He was considered to be in his own league above all those who have portrayed Superman. George Reeves was an icon. 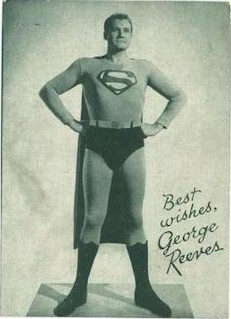 This is our new George Reeves Collection page. 1950's Promo Card (like one above) - RARE and highly desriable. Superman ring - EXTREMELY RARE!! MUST SEE!! "Superman in Exile" - 1954 - ORIGINAL vintage lobby card. NICE!! "Superman's Peril" - 1954 - Very RARE Original vintage lobby card. Great scene! "Superman and the Mole Men" - 1951 - ORIGINAL One Sheet, French Release, Stunning Artwork, MUST SEE!! "Superman and the Molemen" - 1951, Original vintage still and campaign book. "Calling All Husbands" - 1940 - One of his earliest and rare comedy roles. NICE UNUSED lobby cards! "Man at Large" - 1941 - Rare Title Card. Great graphics and shot of Reeves.